The decade long civil war in Sierra Leone left the already weak infrastructure destroyed and in shambles. With no resources or leadership to rebuild, the devastated nation fell into deep poverty and dire circumstances for the health of the population began to deteriorate. To date, Fort Yuma Rotary has funded 8 water wells. Said Sackrider, "I heard that many thousands of children were suffering from severe dysentery and even death because of unclean water. I now spend two weeks every year volunteering in Sierra Leone to ensure they have access to clean water. The children are healthier and have more time to learn and to play now they are freed from the daily labor of fetching water from polluted and dirty ponds or rivers." The Rotary Rose Parade Float Committee is composed of over 100 individual Rotarians from over 35 Districts and has six sponsoring Districts. 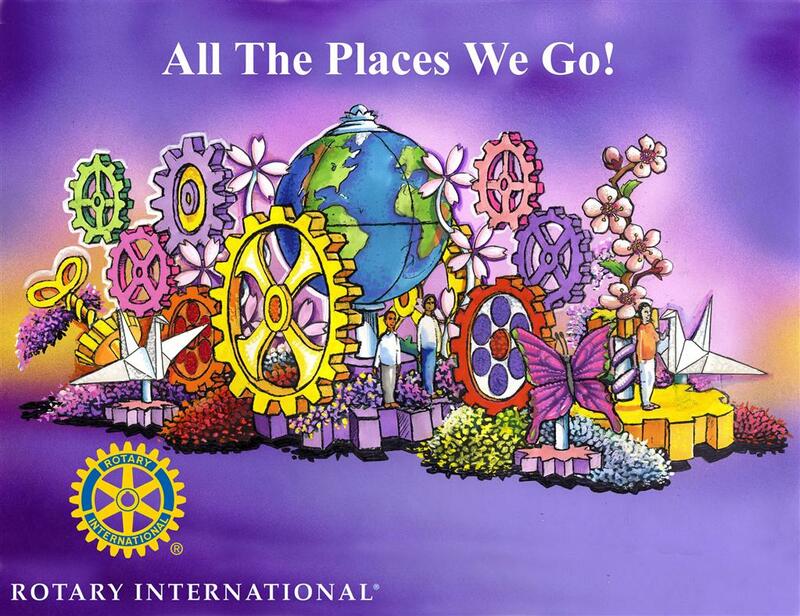 The goal of the committee is to promote Rotary International to a worldwide audience by presenting a Float in the Tournament of Roses Parade. The committee works throughout the year raising funds from Rotary Clubs within the USA and Canada and individual Rotarians, designs the float, selects the theme for the float which corresponds with the theme for the Rose Parade and Rotary International's theme for that year. The Committee also works with over 1,000 other Rotary volunteers to decorate the float with all organic materials. Rotary International is a global humanitarian organization with more than 1.2 million members in 34,000 Rotary clubs in over 200 countries and geographical areas. Rotary members are men and women who are business, professional and community leaders with a shared commitment to make the world a better place through humanitarian service. The Fort Yuma Rotary Club conducts fundraisers throughout the year to help fund local welfare agencies. We also provide scholarships to local high school students, clothes for the needy, food for the poor, help for the elderly, books for school children and much needed assistance to struggling schools. Fort Yuma’s most famous fund raiser is Mardi Gras on Main. Tens of thousands of people crowd down town for the annual Mardi Gras celebration that will take place again on February 2nd 2013. Music, food and fun fill the day for a good cause. Fort Yuma truly believes in supporting the local community as well as taking care of our international responsibilities. The generosity of not only the Fort Yuma Rotary club, but the Yuma Rotary Club, Foothills Rotary Club and the Yuma Sunrise Rotary Club have all donated funds to help construct this year’s Rose Bowl Parade float. The float is funded solely through donations and takes many months to construct.